A moving tale of the triumph of the human spirit amidst heartbreaking tragedy, told through the eyes of a charming, impish, and wickedly observant Afghan boy The Taliban have withdrawn from Kabul's streets, but the long shadows of their regime remain. In his short life, eleven-year-old Fawad has known more grief than most: his father and brother have been killed, his sister has been abducted, and Fawad and his mother, Mariya, must rely on the charity of parsimonious relatives to eke out a hand-to-mouth existence. Ever the optimist, Fawad hopes for a better life, and his dream is realized when Mariya finds a position as a housekeeper for a charismatic Western woman, Georgie, and her two foreign friends. The world of aid workers and journalists is a new one for Fawad, and living with the trio offers endless curiosities--including Georgie's destructive relationship with the powerful Afghan warlord Haji Khan, whose exploits are legendary. Fawad grows resentful and worried, until he comes to learn that love can move a man to act in surprisingly good ways. But life, especially in Kabul, is never without peril, and the next calamity Fawad must face is so devastating that it threatens to destroy the one thing he thought he could never lose: his love for his country. A big-hearted novel infused with crackling wit, Andrea Busfield's brilliant debut captures the hope and humanity of the Afghan people and the foreigners who live among them. 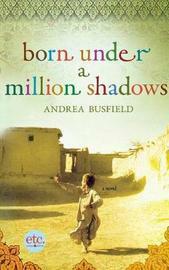 Andrea Busfield is a British journalist who first traveled to Afghanistan to cover the fall of the Taliban in 2001 as a reporter for the News of the World. She is now a full-time writer living in Bad Ischl, Austria. Born Under a Million Shadows is her first book.